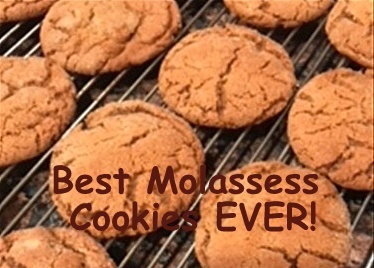 The Best Molasses Cookies EVER! This is no joke. Just wait til you try them! In the small town of Franklin, just south of Nashville, sits a small locally owned bakery and café that will rival any grandmother’s kitchen! Their baked goods–pies, cakes, scones, muffins and cookies will put even the best baker to shame. I stop by for lunch, tea or just to grab a sweet treat each time I visit my sister, and often times this includes a few of Merridee’s giant molasses cookies. I know what you’re thinking…but, the calories! Calorie’s be damned when cookies taste this good. I spent last Christmas in Franklin and of course we stopped by many times for tea and treats. I was fortunate enough to get the recipe a few days before I left. When I got home I just had to make a batch for myself. They turned out fantastic and the recipe is super easy. The cookies bake up crispy on the outside and chewy on the inside, just the way a cookie should be. Try them for yourself. You won’t be disappointed, I promise. Melt shortening in a 3 or 4 quart saucepan over low heat. Remove from heat; let cool. Add sugar, molasses and egg. Beat well. Sift together dry ingredients and add, all at once, to the sugar, molasses mixture. Mix until well blended (the dough will be stiff, so don’t panic). Chill at least one hour. Form dough into 1-inch balls, roll in granulated sugar and place on greased cookie sheet 1-inch apart. Bake at 375°F for 8-10 minutes; just until set and lightly browned. They should be crunchy and chewy when cool. Makes about 2 dozen. Store in a lidded container, so they don’t dry out. The only change I made to the recipe was rolling them in vanilla sugar, because I had some on hand and I wanted to try it out. YUM! I also used a small ice cream or sorbet scope to form the balls, which made forming the balls easier and the cookies all came out the same size.